Last month, for the week leading up to and including Memorial Day weekend, I went on a solo sojourn and stayed in the Mission Lookout Tower, which is just outside of Swan Lake. So, for 5 nights and 6 days, I situated myself 40-feet up off the ground in a 15X15 glass nest perch in the pines, with a 2-3 foot wide wrap-around deck, which afforded me sweeping views of the Swan Range to the east and the Mission mountains to the west. I reserved this recent solo stay at Mission Lookout back in November, because I knew that come mid-late May, I’d be in need of some time of restoration and refueling of my energy tanks – and boy was I right! Prior to heading to the tower, my energy was sorely waning and I was feeling over-extended and organizationally meetinged-out. I recorded my debut spoken word album and had a release party and performance in March; I was one of the directors of our statewide spring retreat in April; and was in charge of our big annual community yard sale fundraiser at our mindfulness center in Missoula two weeks after the retreat – on top of working part time as a nanny, being a weekly hospice volunteer, taking care of my family household, having a regular writing regiment, and so on. And this isn’t anything special or unique – we all have a myriad of things that we tend to on an ongoing basis. No matter how glad we may be to invest our energy into all the different things that we do, there comes a time that in order to continue doing those things, we will need to find, create, and make important the art of resting and self-care, lest we become completely and utterly exhausted and kaput. So, developing a relationship with cultivating our own sense of balance between being active in the world and learning how to rest and replenish is not just something nice to do, it’s vitally important to our ability to continue beautifully into the future – to keep actively practicing in our spiritual mindfulness tradition and in all of the endeavors we participate in: work, school, family life, social life, home upkeep, traveling, volunteering, recreation, hobbies/interests, etc. We extend ourselves out and about in so many ways and we can liken ourselves to a car: our gas tank can only take us so far before we need to refuel. If we have more energy going out than that which is coming in, we will find ourselves eventually broken down and stranded on the side of the road. And this is a position that is all too commonplace in our culture. We are a nation of doers. And there’s nothing wrong with that! The hitch in the giddy-up is that we are not well-acquainted with how to ongoingly restore ourselves. We don’t prioritize – alongside of: work, family, friends, and so on – the practices of stopping, resting, nourishing, and healing. I’ve been investing intentional practice around the fact that my stepson is growing older and will soon be “out there,” left to his own devices, since even before he entered high school, so as not to not experience what I’ve heard so many parents of senior-year students speak to, in terms of being caught off guard and full of sorrow that their kids were all grown up and moving out. It seemed to me a rather implausible reality that a parent should feel so suddenly disjointed at the prospect of their child reaching a certain young-adult maturity level, as though they somehow didn’t see it coming all the years of their youth and moving out to start a life of their own wasn’t part of the deal. But now I sorta get it. Despite all my efforts to look deeply into the nature of impermanence and work to develop my practice in the art of letting go, just the other day I suddenly realized that my husband and I’s time with my 18-year old stepson is incredibly short. I did the math. Given how our residential schedule is lined out in our parenting plan – a schedule we’ve up-held diligently since he was at the tail end of first grade – we have a total of three remaining weeks with him until he graduates from high school, at which point he will be choosing to live full time with his mom and stepdad. Just this morning I came across a lovely quote from Jack Kornfield on twitter, which states: To let go does not mean to get rid of. To let go means to let be. When we let be with compassion, things come and go on their own. In only the way a cat can, I was commandeered – in the best way possible – unable to break free. And, as we were sitting outside, I was afforded the luxury of time to look up and ponder the merits and inspirational value of the two towering elm tree friends posting guard in our backyard. So, it was just this morning that I was able to determine, without wavering, that while they are cause for dismay and require great efforts of manual labor at times, their beauty, wisdom, and fortitude offer far more benefit. I realized, too, that the one directly overhead of me had a sense of humor, as it was pelting me occasionally with small bits of twigs and leaves as I was writing. P.S I thought it worth mentioning that I have mild-moderate levels of hesitation in fashioning and posting this photo array from pics I took this morning, as there is a part of me that wants to stay in close personal accord with not becoming one of “those” kinds of cat people. But after careful consideration, I decided it was worth the risk. Prompted by a friend’s request to meet up with me next week to discuss ways of being more organized, I decided to utilize her inquiry to fashion this post. My friend explained that while she spends her days feeling super busy, she doesn’t get anything done. Her judgement was that I am someone who takes care of a lot of different things, accomplishes a lot, and is very organized, all of which, I would agree, are true. She also knows that I actively practice being a non-busy type of person – so, basically she’s looking for some how-to advice. At first, I wasn’t sure what I would be able to pass along to her by way of useful information, as I’ve never thoroughly dissected what it means to be organized and efficient. For me, being organized is something that comes very naturally and is in my blood – both my maternal grandfather and my mom were/are especially adept at it. It’s only been in the past few years that I’ve come to realize that being organized is a skill-set that often causes me to stand out, in the sense that it’s a talent many others wish they had. I was trying to think about whether anything can happen without the passing of time. I don’t think so. Everything takes time. Whether it’s something good or something bad it require time to manifest. Of course, the amount of time varies but everything does take a certain amount of time. We may want things to happen quickly, or instantly, but life simply doesn’t work that way. What has me thinking about this passing of time is my current healing process, after having had shoulder surgery 3 weeks ago. A lack of info from my doctor beforehand in regards to what I should expect post surgery sent me researching online. Fortunately I came across a few very helpful sites that stated it would be 9-12 months before I should see full function and strength return after surgery. This info helped me to have a general idea of what to anticipate and allowed me to be develop a realistic approach to healing, rather then set up intangible goals. Often we have irrational and illogical ideas when it comes to how long we think things should take – whether it surrounds our losing weight, stopping smoking, mourning the loss of a loved one, finding a well matched mate, learning something new, cultivating closeness/friendship/community, healing from trauma or illness, transforming unskillful habit energies, or starting a new chapter in our lives. 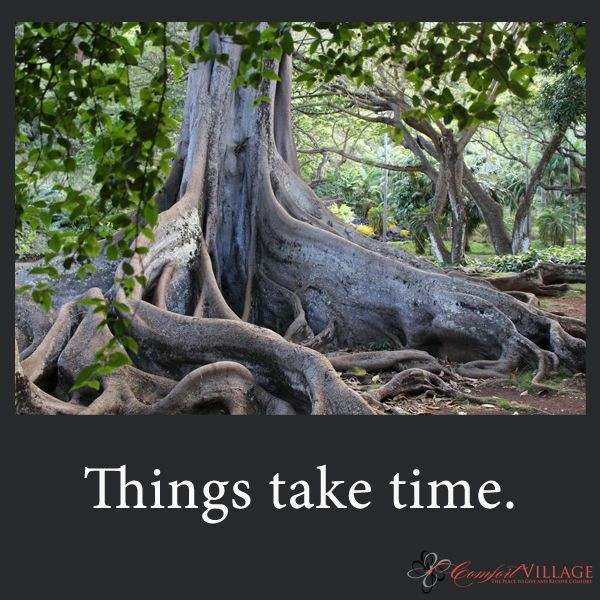 Things take time.